It has been thirty years since Terence Blanchard first hit the jazz scene as Wynton Marsalis’ handpicked replacement in Art Blakey’s Jazz Messengers and then lead a memorable “young lions” quintet with saxophonist Donald Harrison. Since then, Mr. Blanchard has scored over 40 films, including all of Spike Lee’s since Mo’ Better Blues; been nominated for eleven Grammys® (and won five); served as artistic director of the Thelonious Monk Institute of Jazz; been a first call sideman and led his own group that has recorded twenty albums. In addition, Mr. Blanchard’s first “Opera in Jazz”, Champion, about the life of the late boxer Emile Griffith, recently premiered in St. Louis. Suffice to say that Terence Blanchard has been quite busy. His twentieth album also marks his return to Blue Note Records for which he last recorded 2007’s A Tale of God’s Will (A Requiem for Katrina) for which he won the Best Large Jazz Ensemble Grammy. His new album, titled Magnetic, features ten original compositions, all by Mr. Blanchard or the members of his latest quintet; Brice Winston on saxophone, Fabian Almazan on piano, Kendrick Scott on drums and 21-year-old newcomer Joshua Crumbly on bass. In addition, there are guest appearances by bass legend Ron Carter, saxophonist Ravi Coltrane (son of a legend) and guitarist Lionel Loueke (likely to be a legend). Blanchard has been experimenting with a number of styles, from classical to Latin to hip-hop on some of his recent recordings. Though those experiments were always interesting and often successful, it’s great to find him on Magnetic, back at his base in what is essentially a first-rate post-bop blowing session. The title track kicks things off. It’s a knotty mid-tempo piece, peppered with staccato horn blasts and various electronics including Blanchard’s use electronics which at times give his trumpet a guitar like sound. “Pet Step Sitter’s Theme Song” has a mellow funk rhythm over which the group lays down some exploratory solos with Ravi Coltrane’s tenor runs being the highlight, Blanchard’s electronic trumpet sounding like a keyboard and Loueke’s guitar comping in the background. Lionel’s vocalizing and chord runs are subtle at first, then grow in prominence to give the piece a shift in direction. Drummer Scott contributed the hard-driving “No Borders, Just Horizons”, which opens with a powerful two-minute drum solo and then moves surprisingly into a Latin swing over which Blanchard blows one of his best solos on the album before turning things over to Winston’s tenor, which is also in fine form. “Central Focus”, which Blanchard originally recorded on his Simply Stated album twenty years ago and it makes welcome return here with Blanchard showing what he has learned in the ensuing two decades and Scott setting a beat that is impossible to ignore. Winston’s “Time to Spare”, which he originally recorded on his debut solo album three years ago, appears here in an improved version. Winston is more confident and his tenor runs, which show the influence of Joe Henderson, are more self-assured. The highlight of highlights is “Don’t Run” which features the great Ron Carter on bass and Ravi Coltrane on soprano sax. The tune takes its title from a joking admonition that Carter made to Blanchard to “Stop running from me, man”, when the trumpeter would suggest that they work together. “Don’t Run” is 7 ½ minutes of jazz awesome, with Blanchard, Coltrane, Carter and Scott, just blowing their brains out. Coltrane starts it; with one of his best solos on soprano that I’ve heard to date. Blanchard comes behind him, clearly intending to not be outdone and Carter, is his usual Hall of Fame self. 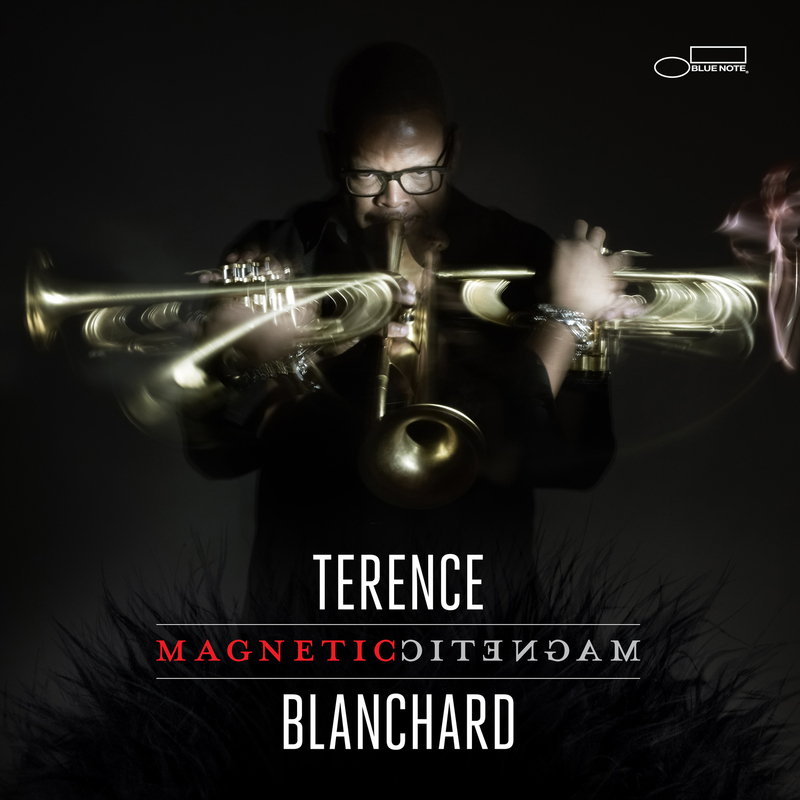 Magnetic is a mature and winning artistic statement from Terence Blanchard and his quintet. He demonstrates that in spite of the film work, the operas, the Broadway scores and the other things that divide his attention, he remains one of the best jazz trumpet players working today and that he has the recordings to back it up. Last year, we took an impromptu look at the jazz artists nominated for Grammy Awards a couple of days before the telecast. It turned out to be one of our most popular posts in 2012. Because we don’t want to mess with success, we’ll do it again in 2013. This time though, we’ll start a bit earlier and continue periodically until the awards are presented on February 10. Let’s start with the jazz equivalent of Record of the Year; Best Improvised Jazz Solo. On Spirit Fiction, Ravi Coltrane starts to fulfill the potential that has long been predicted for him. If it has taken him a while, cut him some slack, being the son of John Coltrane and playing the same instrument as his legendary dad is an insane load to bear. IMO, “Cross Roads” is not the album’s strongest track but it’s nice to see Ravi’s work recognized. There seems to be an unwritten Grammy rule – if Chick (or for that matter, Herbie) release anything in a given year, it is required to get a Grammy nomination. This album pulled down two noms, one for the title song in this category and another for Best Jazz Instrumental Album. Hot House, the album, is very good and “Hot House”, the track, is one of two standout cuts on disc, so the nod is not unexpected. Corea and Burton play with gusto here and their interplay is top-notch. Name recognition makes this one the favorite to take home the trophy. Surprise! Another nomination for Chick Corea (see the above rule). This is a fine performance of the Bill Evans tune by Chick, bassist Eddie Gomez and the late Paul Motian, from their live tribute album to Evans, recorded a couple of years ago. This album is also nominated for Best Jazz Instrumental Album. Mr. Corea is in his element here and he gets great support from his bandmates, both well-known Evans trio veterans. There’s nothing new or really surprising here, but it works. Also stands a good chance to win because of the presence of Chick and two other legends. For my money, this is the best of the nominated tracks. “The Real Kenny G” is on fire on this tribute to one his major influences, the great Jackie McLean. Garrett is inspired and he clearly inspires the rest of the band – listen to pianist Benito Gonzalez pushing Garrett before Gonzalez explodes with his own solo. A dynamite track from a dynamite album (which is another of the Best Instrumental Jazz Album nominees). Maybe the Corea votes will cancel each other out and “J. Mac” will emerge victorious. We’ll wait and see (and hope). I must start by confessing that I’m not as big of a fan of Brad Mehldau as many other people are. I don’t dislike his playing and I certainly respect his artistry, but his style often leaves me cold. That being said, “Ode” is one of my favorite Mehldau tracks. It has a lighter touch than a lot of his work and because of that, I found myself thoroughly engaged from beginning to end. Again, “Ode” may be blocked by the Corea firewall, but it deserved to be nominated. These tracks and others from Grammy nominated jazz albums can be heard on Curt’s Café Noir, our 24/7 web radio station on Live365, right up until February 10. We feature these tracks daily, from 4 pm – 6 pm on “The Grammy Show”.